Addressing an election rally in Theni, a southern town in Tamil Nadu, Gandhi claimed Congress manifesto for the Lok Sabha polls was the voice of the entire nation. Taking a veiled dig at Prime Minister Narendra Modi’s radio talk programme, Congress president Rahul Gandhi on Friday said his party’s manifesto was not the “Maan Ki Baat of one megalomaniac” but talked about work of the nation. Addressing an election rally in Theni, a southern town in Tamil Nadu, he claimed Congress manifesto for the Lok Sabha polls was the voice of the entire nation and he was happy that many people lauded it. “Congress manifesto is not the “Maan Ki Baat of one megalomaniac this is Kam Ki Baat (a talk about work) of the nation,” he said. Describing as “most revolutionary” NYAY, his party’s poll promise of Minimum Income Support Scheme which envisages a payout of Rs 72,000 per year to the poorest of the poor, Gandhi asserted no government in the world had so far attempted such a plan. He accused the Prime Minister of pursuing “negative economics” and said people’s purchasing power collapsed and it led to goods left lying in factories. “Because, if we give Rs 15 lakh we will destroy the economy. But, we can give Rs 3,60,000 (through Nyay to the poor; over five years) without causing any damage to the economy,” Gandhi said. He said the Nyay scheme will strengthen the economy and give people the purchasing power which would in turn kick start the economy. The outcome would make everybody barring Modi happy. Modi would not be able to give thousands of crores to big business owners like Ambani, he charged. Gandhi alleged Modi is the element of hate among Indians. “We are not going to fight Narendra Modi with hatred. We are going to fight Modi’s hatred with love and affection among the Indian people,” he said. In an apparent reference to allegations that the ruling AIADMK in Tamil Nadu was subservient to the BJP, the Congress president said he was surprised Modi was ‘convinced’ he can run the state from Delhi. “He has no idea of Tamil Nadu. I don’t think this man has read anything about Tamil history. I don’t think he understands the Tamil language. He certainly does not understand the Tamil spirit,” he said. History had shown that only the Tamil people had all along decided their future, he said adding he would send Modi a book of rationalist leader “Periyar” EV Ramasamy so that he can read it and understand the people of the state. “Also, maybe a “few books of Karunanidhi ji. 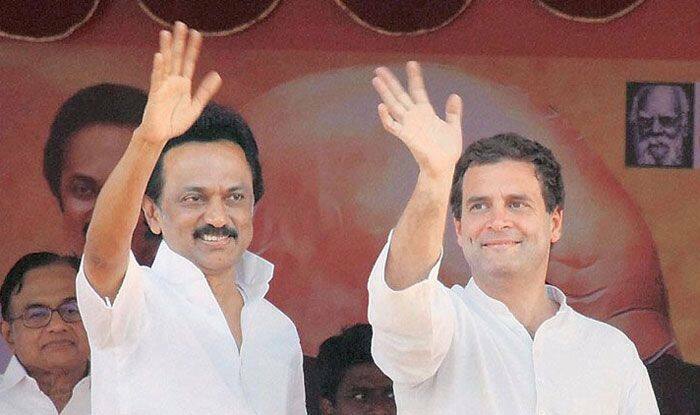 The gentleman has no idea of what Tamil Nadu is…I am confident our alliance is going to win,” he said. The references to Periyar and Karunanidhi are seen as a pointer to the well-entrenched Dravidian ideology in Tamil Nadu which is an antithesis to the Hindutva.